3D Systems has integrated the combined power of Geomagic, Rapidform, Alibre and Sensable into Geomagic Solutions, which I believe will be at the vanguard of 3D authoring and is already one of the most creative, innovative and passionate groups around. This group is reinventing the engineer's desktop. And I am honored to be a part of it. 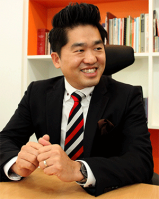 My name is Calvin Hur, 3D Systems' vice president and general manager of Geomagic Solutions. I am humbled and excited by the huge responsibility as head of this team, especially because my path here has been so focused on these amazing content-to-manufacture solutions. After receiving my Ph.D. at Seoul National University (my research project involved inventing a new 3D printing device and its software), I worked as an application developer, marketer, product manager and sales manager. Later I became the CEO of INUS Technology, Inc. (Rapidform's development company) until INUS was acquired by 3D Systems. It has been a long, 14-year journey. The story of Geomagic Solutions began with 3D Systems' acquisition of Alibre in 2011, and it goes through to the Rapidform acquisition in 2012 and Geomagic/Sensable in 2013. The process, players and tools were carefully considered throughout the process for their ability to complement one another in capabilities and, more importantly, potential. We are building for the future. Prior to these four smaller companies coming together, each enjoyed great success in niche and emerging markets. Geomagic, Rapidform, Alibre and Sensable stood tall in their respective markets as awesome, inventive technologies. But it was not always easy for us to stake our claim as part of a larger more complete scan-to-manufacture workflow without support from the other companies who would play a part in that workflow. And it's safe to say that we all dreamed of a day when we could bring even more 3D power to everyone in product design and manufacturing fields. We all looked forward to a future when scanning, design, touch input, inspection, manufacturing and 3D printing could crystalize into one dynamic entity. With this merger, that time has come. We've gone from several bridge technologies to a fully fused network, an end-to-end solution provider for design-to-manufacturing. This is an historic moment. Four companies with the same goal, complementing each other, strengthening previously weak links, fitting together like puzzle pieces. It's the spark of a new level of workflow innovation. Our technologies are already looking toward the future, and our people are passionate about bringing that future closer. To top it all off, we've got the production power and vision of 3D Systems on our side, so our customers can go farther than they ever have before from scan to design to production. And don't expect us to sit and watch our technology. With all this firepower and expertise, we will be moving forward and moving forward fast, updating existing products and inventing new ones. All of our upcoming products are going to be geared toward closing workflow gaps, faster processes, more complete interoperability, powerful new tools and convenient interfaces. We will deliver nothing short of game-changing design and manufacturing software. In short, we are working for our customers' success and delight. It's been a long time coming for such a fusion of technologies and expertise. The industry doesn't have to wait anymore for the innovations and products that can not only revolutionize product design and manufacturing but also make the whole process more enjoyable. I invite all of our customers and partners along for the ride as we continue to manufacture the future. And remember that our future is not so far.